Cut Through That Flossing Excuse! Oh, great, you’re probably thinking. Another blog post telling me how important flossing is. Well, yes, but please give us a break. The epidemic of non-flossing is simply too widespread for us to abandon our quest to educate tooth owners everywhere. Flossing is critical for good oral health, and therefore your overall health. Got a good reason why you don’t floss? We’ve heard pretty much all of them over the years. But what you’ll read below is more than just a sad list of excuses. In an effort to persuade you to finally adopt good flossing habits, we’ve included a few helpful suggestions as to how to overcome any reasons for not flossing. “Brushing (or mouthwash) is enough.” Mouthwash cannot remove the plaque that sticks to teeth, which is why you still need to brush at least twice a day. However, brushing is unable to get the hard-to-reach areas between the teeth, so you also need to go a step further and floss between the teeth to remove harmful bacteria before it causes other oral issues. “Flossing causes my gums to bleed.” Bleeding can occur for a few different reasons. The most common may be counterintuitive: it’s that you aren’t flossing enough. With regular flossing, the bleeding should stop within a week or two. If it continues, you may be flossing too hard- digging into the gum. Start flossing gently once a day, give it a week or two, and the bleeding should subside. “I can’t remember to floss.” Remembering to floss is as simple as remembering to brush. 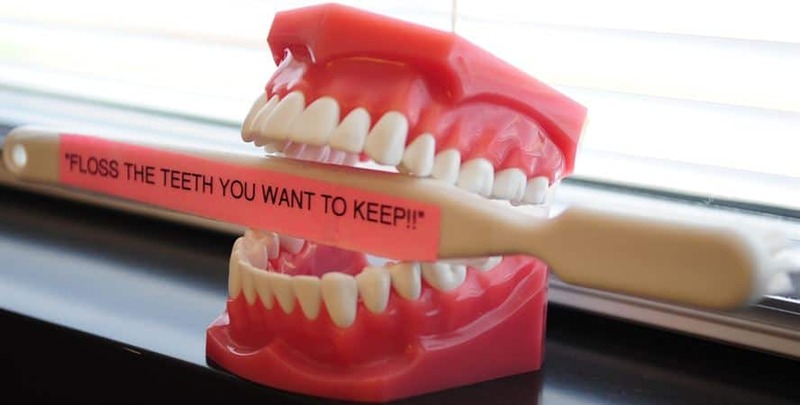 If you store the floss in the area with your brush it will be impossible to forget. Or put the floss on the arm of a chair where you sit to watch TV. “I don’t have time to floss.” It seems like we’re all short on time these days, and the holiday season presents even more of a crunch. Fortunately, floss is highly portable and you can do it whenever there’s a minute or two of downtime during your day. Throw a pack of floss in your pocket or purse. Or, take a couple of minutes before bed. “I don’t know how to floss properly.” There’s not much reason for this one. Flossing is simple, and flossing technique is not exactly top secret information. We’ve already divulged the key to preventing bleeding, and you can read a few other useful tips on flossing we’ve shared before. Just click the link. If you STILL hate flossing, consider water flossers such as Waterpik. Some of the staff here at Susquehanna Dental Arts has recently made the switch, and we absolutely love our results. If you’d like a firsthand account of these amazing new products, feel free to ask us on your next visit, or give us a call at 717-285-7033 to learn more. Posted in Informational and tagged flossing, flossing excuses, flossing tips, water flossers, waterpik on December 19, 2017 by admin.